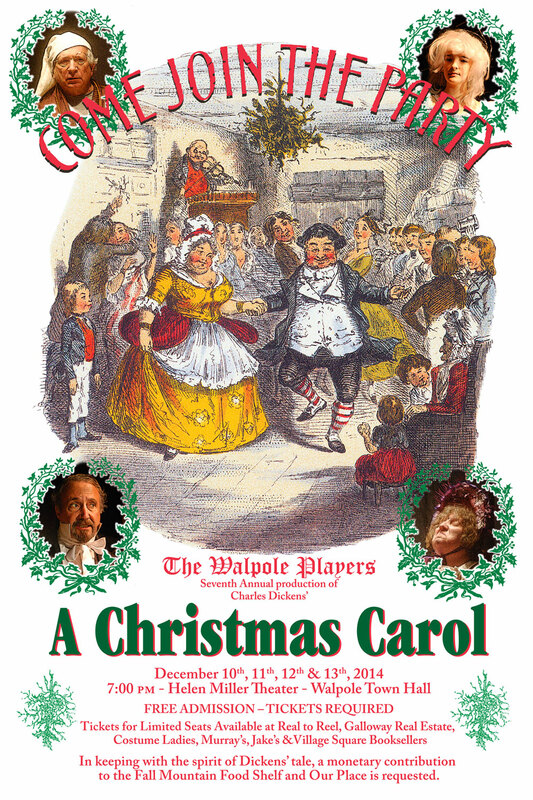 Please spread the word, and share this post – A CHRISTMAS CAROL is this coming week when Charles Dickens arrives in Walpole. The tradition will continue when the curtain will again rise for the Walpole Players’ Seventh Annual Production of Charles Dickens’ A CHRISTMAS CAROL on December 10, 11, 12, and 13, 2014, in the Helen Miller Theater in the Walpole, New Hampshire Town Hall. Having raised over $20,000 in cash donations to help feed those less fortunate in the past 6 years, 100% of the cash donations at the door again will benefit Our Place Drop-In Center and The Fall Mountain Food Shelf. But the curtain almost did not rise this year. Co-directors, Tara Sad and Ray Boas, were shocked when the usual throngs did not appear at the two evenings of auditions in early November. 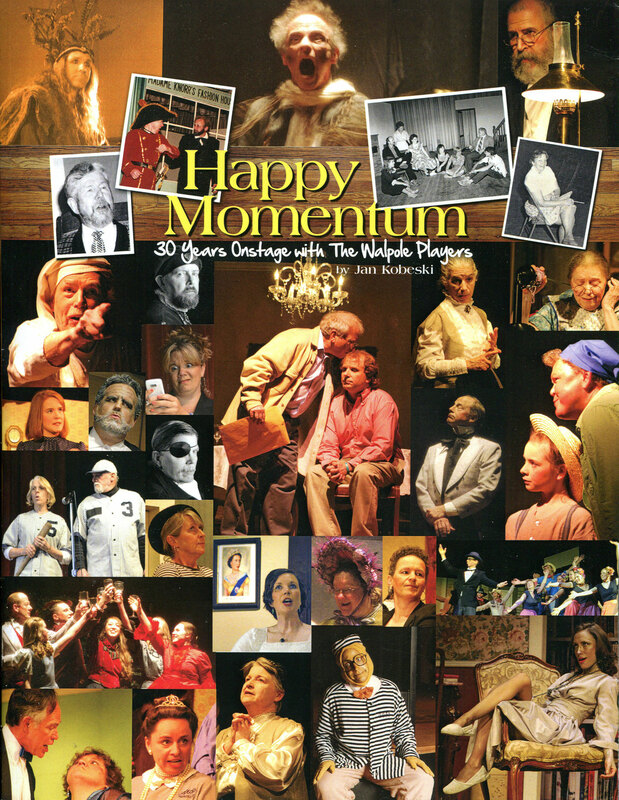 “We were lacking actors for ten speaking roles, and about to scrap this year’s production, which has become an area tradition,” Tara recounted, “when I said to Ray, ‘let’s send out an additional casting call.’ ” So, Ray drafted a plea which was emailed to the players’ list and posted on-line. The response was gratifying. Greg Villone, who was busy in a current Springfield, (VT) Community Player’s production, typified the response stating, “I was planning on taking a little break after this one but seeing how ACC is in danger of being cancelled I will gladly play Fred again.” And so; thankfully, for those less fortunate, the show will go on. Tickets to the 7 PM production on December 10,, 11, 12 and 13, 2014, are required because of limited space, and hold your seat until 6:45. “No one has ever been turned away at the door,” Ray happily relates, “but I have had to put up additional chairs to accommodate additional guests.” The free tickets are available in Walpole at Real to Reel; Galloway Real Estate; Costume Ladies; Murray’s and Jake’s; and, in Bellows Falls, Vermont, at Village Square Booksellers. For any questions call Ray Boas 603 756-4545 or Tara Sad 603 756-4861. A CHRISTMAS CAROL has been read and performed since 1843 — and since 2008 in Walpole. Please mark your calendars to attend and be included in Walpole’s tradition. This entry was posted in A CHRISTMAS CAROL and tagged A CHRISTMAS CAROL, CHARLES DICKENS, The Walpole Players, Walpole NH. Bookmark the permalink.